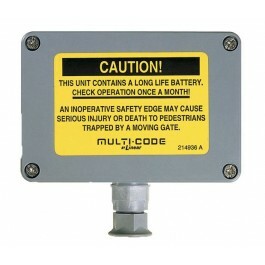 The Model 105104 Gate Safety Edge Transmitter is for adding obstacle sensing for motorized gates or barrier arms. Using a safety edge transmitter is more economical and discrete than the traditional coiled cord connection method. 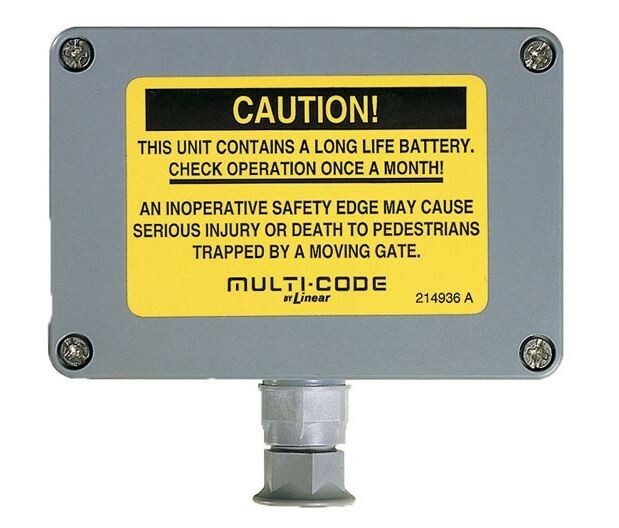 The transmitter mounts directly on the gate or barrier arm and wires to a standard exterior safety edge sensor (a Miller gate edge sensor is recommended). If an obstacle is encountered, the sensor will present a closed circuit across the connecting wires and the 105104 will transmit a message to the receiver signaling entrapment to the gate operator. The operator then stops or reverses the movement of the gate. The 105104 transmitter is supplied in a weather-resistant, fiberglass box. Its circuit board is coated to prevent moisture damage. The enclosure mounts to the gate, door, or barrier arm through sealed interior mounting screws. The Model 105104 is compatible with 310 MHz Stanley receivers and Model 109950, 302850, and 309013 receivers.